There are many career options for those who want to work with marine animals in some capacity. These careers range from training dolphins for major marine parks to conducting marine biology research studies on a particular species of interest. Below are several popular job possibilities for those interested in pursuing a marine career. Marine mammal trainers work with many different species such as dolphins, whales, seals, and sea lions. Trainers use operant conditioning methods to elicit specific behaviors from the animals under their supervision. Many marine mammal trainers also participate in shows and demonstrations for the public at the facility they work for, whether these are educational events or simple entertainment. Successful marine mammal trainers usually have some combination of formal education and hands-on training in the field. Marine mammal trainer wages can vary widely depending on the duties of each specific job, but an average range of $30,000 to $40,000 per year is possible. Marine biologists are scientists who study all types of marine life. Marine biologists may focus their careers by working in areas such as research, academia or private industry. Advanced degrees (at the Masters or Ph.D. level) are usually required for positions in the field, particularly in education or research. The salary for marine biologists varies based on the level of education. Entry level positions begin around $40,000 per year, while those with advanced degrees may earn over $100,000 per year. Fish and game wardens monitor wilderness areas, manage native species and ensure that hunters and fishermen comply with state and federal laws (as well as any additional local regulations). Work with aquatic species is possible in a variety of patrol locations such as wetlands, ponds, lakes, and rivers. Two to four years of college is required, and most new hires receive extensive on the job training. The salary for fish and game warden positions may vary, but it usually ranges between $50,000 and $60,000 per year. Aquarists take care of marine animals kept in the collections of aquariums, zoos, marine parks, and research facilities. They are responsible for all aspects of basic care as well as maintaining proper water quality. These positions generally require a four-year degree. Scuba certification is also a common requirement since aquarists may spend a significant amount of time in the tanks to complete their feeding and tank maintenance duties. Experienced aquarists can expect to earn $40,000 to $50,000 per year, with the starting salary for new aquarists being about half of that amount. Ichthyologists are biologists that study fish, sharks, and rays. Positions in ichthyology are available in several areas including research, teaching and animal collection management. A bachelor’s degree is required, at a minimum, to be considered an ichthyologist, with most positions requiring more advanced degrees at the Masters or Ph.D. level. Salary varies based on experience and level of education, but compensation in the neighborhood of $60,000 would be a reasonable expectation. Aquaculture farmers raise fish and shellfish for a variety of uses such as food, bait or breeding stock. Basic animal care, water quality maintenance and personnel management duties may be a part of an aquaculture position (both technician and management positions are available in the aquaculture industry). Entry level positions may only require a high school diploma, but college degrees are preferred for managerial candidates. An aquaculture technician could expect to earn a salary in the range of $30,000 per year, while an aquaculture manager could expect to earn $60,000 per year or more. 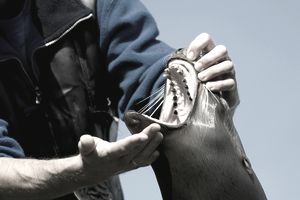 Wildlife veterinarians provide health care services for a variety of marine mammals, fish, and other marine life. They may provide annual exams, treat injuries, prescribe medication and perform surgery when required. Wildlife vets may choose to work in private practice or for businesses such as zoos, marine parks, aquariums, and research facilities. The median wage for all veterinarians is about $90,000, but salary can range from $50,000 to $150,000, or more per year depending on the vet’s particular specialty and level of education completed. Board certified practitioners generally earn top end salaries. One final note, completing marine animal internships can be an important step towards a future career in the marine animal industry. Students who complete these hands-on learning opportunities gain valuable hands-on experience that can really enhance their resumes.